JALGAON – 425 001 INDIA. The Language of the journals is English. Send 1 hard copy with CD. The MS must be typed in double space on the one side of the sheet [9” x 11”] and have a margin of at least 4 cm on the left hand side. Type scripts should be carefully checked before submission. No changes to the original manuscript will be allowed at any stage of publication. The general arrangement of the paper should be: ABSTRACT, INTRODUCTION, MATERIAL AND METHODS, RESULTS, DISCUSSION, ACKNOWLEDGEMENTS AND REFERENCES. Words to be printed in italics should be italics / underlined. Tables must be typed, double spaced on the separate sheets. A concise heading and number appear above and the explanations below. Figures [line drawings and half tones] must be supplied as sharp prints suitable for direct reproduction. Photographs must be clear, highly contrasted, black and white glossy prints in the format. The colour photographs of good quality may be considered for printing. Legends must be provided on a separate sheet, typed in double space. Lettering on figures should be large enough to be readable after photographic reduction. 2. Prakash, R (1990). Management of Water Resources. In: Aquatic Ecosystems (Ed. Gautam, A.) Ashish publishing House, New Delhi, pp. 1-10. (Paper published in Book). 3. 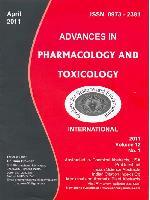 Prakash, R. (1989) Recent Trends in Toxicology, Jagmendar Book Agency, New Delhi. (For Book). Author (s) have to transfer of copyrights from the author (s) to the editor-in-chief. There will be no printing charges, however, the authors have to pay the cost of reprints.